Available lengths are at 20 and 40 meters. Custom length options are possible under an OEM/volume request basis. 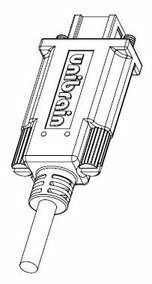 The most important factor considered on any Firewire topology is that sufficient power is provided to the devices guaranteeing stability on the bus. In long distance solutions, there may be significant power loss across the power as well as the data lines. Thus it is strongly recommended that the firewire adapter on the PC side is fed with additional power internally through its power connector. With the 20m (65 ft) version of the Long cable you will be able to operate reliably up to 3 industrial cameras simultaneously without any additional power (provided the firewire adapter in the PC is powered internally though its additional power input). With the 40m (131 ft) version you will need to provide additional power (12V) unless the device is self-powered (e.g. it is an external firewire disk). If the device does not have input for additional power, you can use a FireRepeater at the end of the long cable for providing additional power to the bus through the repeater’s power input jack.